Virginia Monken was content living on her own, well into her 80s. But when she fell down a flight of steps and sustained serious injuries, Monken’s family knew she could no longer live on her own. Four years ago, Monken moved into a studio apartment at Delnor Glen Senior Living, 975 N. Fifth Ave., in St. Charles. She lives independently, but help is close by. Today, Monken can’t imagine living anywhere else. It’s not just the residents who are impressed. Recently, Delnor Glen became one of only 46 health care organizations worldwide, and the first and only long-term care community in the country, to receive the Planetree designation. The nonprofit Planetree provides education and information to help create person-centered care in healing environments, such as health care and senior living organizations. In 2009, Delnor Glen became one of only 25 assisted living facilities in the country to be part of a pilot program for the Planetree designation of assisted living. For nearly four years, Planetree conducted a series of focus groups with Delnor Glen that included site visits and interviews with hundreds of residents, family members and health care staff. Delnor Glen is warm, inviting and boasts a traditional look with pillars and a red brick facade. The main floor features a sunny wicker room, fireplace, baby grand piano and an aviary full of finches. A beautiful dining room is open for three meals a day, all of which are prepared from scratch. The second floor has a library, computers, craft room and a family room for watching movies. The lower level includes a beauty shop, community room and kitchen. All levels have laundry facilities. Candy dishes, fresh flowers and pictures of each resident can be found around the community, just like at home. Large fish tanks can also be found throughout the living center. “We’ve tried to think of everything to make the residents as comfortable as possible,” says Faught. 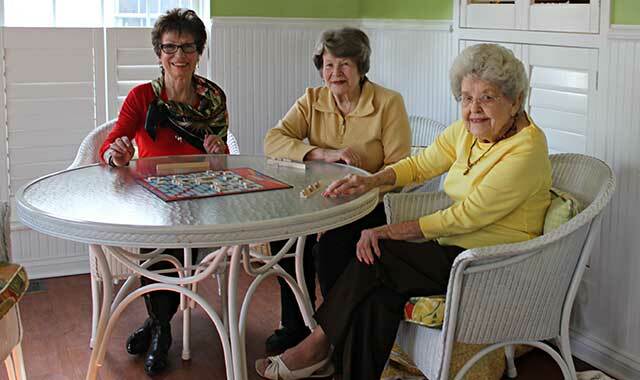 Delnor Glen opened in the late 1990s as an independent living center, serving the St. Charles area. It’s housed in the original Delnor Hospital, which was founded in 1940 by local philanthropists Dellora and Lester Norris. Delnor Hospital and Geneva’s Community Hospital merged in 1985; the new Delnor-Community Hospital opened in Geneva six years later. In the 1990s, some of the original hospital building was demolished and the remaining space remodeled for Delnor Community Residential Living, which opened in 1998. The name was later changed to Delnor Glen Senior Living. Over the years, Delnor Glen, which is now part of Cadence Health, has grown to include 78 assisted living apartments, a 15-unit community designed for residents with memory loss or dementia, and 28 residential townhouses that were built in 2002 just south of the main complex. Faught, who came to Delnor Glen 14 years ago, is passionate about working with seniors. Staff assists residents with a variety of needs such as bathing, dressing, grooming, exercise and help getting to meals and activities. The nursing staff and certified nursing aids are available 24 hours a day to meet all scheduled and unscheduled needs. All staff, including housekeeping, takes part in continuing education in the field of dementia care. Off-site physicians, podiatrists, dentists and home care are available when needed. Residents are often asked for input on key decisions, such as when changes are made to carpeting and furniture. In addition, an in-house residential council votes on issues impacting all residents, and a food committee often shares personal recipes with staff. Delnor Glen also works with family members to ensure that policies and procedures are made in the best interest of residents. Joan Budilovsky did her homework before her mother, Leona, an author, moved to Delnor Glen following the death of husband John, four years ago. Residents at Delnor Glen enjoy taking part in a number of activities and events that are offered throughout the week. That includes knitting, bingo, exercise programs, walking clubs, sing-alongs, and outings to movies, plays and local parks. On Friday evenings, residents are treated to musical entertainment. As a family-centered community, Delnor Glen makes a point of bringing residents and family members together to celebrate life’s special occasions. In the spring, for example, an ice cream social is held for more than 200 residents and invited guests. Last fall, more than 300 people turned out for Delnor Glen’s 15th anniversary celebration, which featured a German theme complete with food, spirits and dancing. A large annual holiday party is held every December. Any job is made easier when you enjoy what you do. This entry was posted on Friday, May 2nd, 2014 at 12:00 pm	and is filed under Mind & Spirit, Top Posts. You can follow any responses to this entry through the RSS 2.0 feed. Both comments and pings are currently closed.